You’ve heard about the flight up to Seattle before our Alaska cruise; now it’s time to talk about the trip home. A couple days into the cruise, I was greeted by a very welcome note. The Port of Seattle — the entity that operates both the cruise port and the airport — has a fantastic free program where you can submit your confirmation number to the cruise line. They will print your boarding passes and bag tags onboard and deliver them to you in your cabin. The program allows you to pay for bag fees, but if you don’t have them (we didn’t thanks to the Alaska Visa), you can state the reason why and they confirm with the airline. Sure enough, Thursday night, we had in our stateroom four boarding passes and two bag tags with no charge. We just had to affix them to the bags and leave them outside our cabin Friday night by 11, and they would be magically transported to baggage claim in LA. I have no idea if other ports do this since I haven’t cruised much, but I can’t say enough good things about the program. On Saturday, the rule was that to take advantage of this program, you had to walk off the ship by 8:30am. So we did, and then we took a Lyft straight to the airport. The place was pure chaos, as is apparently always the case since Delta and Alaska continue their arms race. After waiting in a long line at the curb, we got off and found the Pre Check line on the D gate side surprisingly short. Our boarding passes from the ship worked fine (how did they get those to us more than 24 hours before departure?) and then we realized we had a long time to kill. The kids were bouncing off the walls pretty much the entire trip, so we quickly sought out the play area over near the B gate entrance. We let them run around and go insane while we just sat there reading. My wife grabbed some quesadillas from Qdoba right next door and we wandered over to our gate, back on the other side at D3. I have no idea why Alaska is doing this, but as on our way north, the airplane boarded absurdly early. In fact, we arrived at the gate at 11:10am, 35 minutes before departure, and the gate area was completely empty. Boarding had been completed. The agent took our boarding passes and then sheepishly looked at my wife’s bag. Alaska recently settled on a single carry-on bag size requirement post-merger, and it has decided to aggressively* enforce that rule. (*Aggressively in Seattle, I guess, because nobody cared in LA). My wife was told to put her bag in the sizer and it didn’t quite fit. We were told that she’d let us gate check the bag for free this time, but next month Alaska was going to start charging. Down the jet bridge, there were maybe a dozen bags lined up waiting to be taken down. Once onboard, we saw nothing but largely empty overhead bins… and undoubtedly at least a dozen angry people. On the bright side, I had no problem finding a spot for my bag. I put mine up along with our coats, and then sat down. This airplane, like the last one, looked to be a little worse for wear on the inside, but it was better than the aircraft we took on the way up. We were just focused on trying to keep the kids occupied while we waited to finally leave. Just a couple minutes before departure, this was the scene. But then, a giant among men ambled down the aisle and took the open aisle seat next to me, dashing my hopes of extra space. It was a quick sub-2 hour flight down. I again used the onboard ordering, and this time the flight attendants brought it to us without asking what we wanted. I opted against using the remains of Virgin’s entertainment system on this one since I wanted to finish Cloud Atlas, a book a good friend of mine had suggested and one that had me captivated. My daughter passed out almost immediately, so I had a nice, uninterrupted stretch to read. Descent into LAX was bumpier than usual. We landed early and I was shocked to find out that we had a gate waiting for us. The gate agent came on to tell us bags were at claim 3, so we headed down there. Upon arriving, claim 2 showed as the location for bags from our flight, but nothing came out. At one point, it must have shifted back to 3, but there was a lot of confusion. The guy next to me asked if the New York bags were coming on this carousel. We all just shrugged. More than 20 minutes after landing, my wife’s gate-checked bag showed up. A few minutes later the other two made it as well. Thank you to the Port of Seattle for that seamless baggage experience. But there was one last thing that bugged me. Alaska used to have that guarantee that your bags would show up within 20 minutes or you’d get a discount coupon or miles. I saw no trace of it anywhere in the baggage claim area, so I googled it. Sure enough, it still exists, but you have to go talk to an agent to make a claim. I went into the baggage service office, and the agent there took my boarding pass and wrote up a couple of business card-sized papers for us to redeem online to get the bonus miles or a coupon. I don’t know why this program still exists if the airline isn’t going to talk about it. And I’m also not sure why the process has to be so clunky. Our bag-checking experience with the Port of Seattle was excellent, but this wasn’t the best experience on Alaska. This seems to be the point in the merger where the airline is just struggling to unify the product, and that appears to have created some unfriendly policies and choppy experiences along the way. I hope this phase of the merger is over quickly. Not sure if it is still the case, but last year Carnival was not participating in the luggage program. As far as I know, it depends on the cruise line. Pretty much every time I fly AS the FAs make an announcement about the bag guarantee. Not sure about signage, because I very rarely check a bag. Maybe your PMVX FAs don’t have that part of the script yet? Agreed. Lots of kinks to be straightened out after the merger. PMVX almost still operates like they did before the merger with inconsistent AK procedures and products sprinkled in. It’s pretty confusing and frustrating. Constancy needs to be the name of the game and it’s been a slow process. Too bad because that really turns off loyal customers. Yeah, they make the announcement every single flight too. But I’m essentially always on pre-merger AS or QX flights. I too rarely check bags. I used to claim the miles via Twitter on the fairly rare occasions when the bags didn’t show up in 20 minutes, but I got pushback the last time saying I was supposed to claim the paper receipt at the airport. But I’ve only checked a bag once in the last year or so (it was delivered in less than 15 minutes in YLW), so don’t know what claiming is like now. Brett – I had a similar experience with the gate sizer on day one. I’m a 75k with Alaska; I made sure to send a note to Ben Minicucci, which led to a very productive conversation with the PDX station chief about the use of the sizer and the empowerment of employees to make things right. As for the 20 minute baggage guarantee, it’s alive and well. It’s typically announced immediately after landing by the lead flight attendant. Alaska’s early boarding is a joke. It’s systemwide. The best is Horizon and they expect you to sit on the Q400 for 30 min while it takes them 2-4 times to do a head count. But back to AS, I’ve actually been scolded by gate agents for being late when I arrive a half-hour early. And since I like a cocktail before my flight, and AS merely provides a swig of water preflight, I usually wait in the nearby bar – and listen to several final calls for boarding & passenger names at 30, 25, 20 and 15 min. Don’t get it! QX rarely starts boarding my flights that early. (I fly YLW-SEA every trip, so international.) More typical is starting boarding 25-30 minutes before departure. Yup, I have never been on a QX flight that started boarding at the time that was specified on the boarding pass. Always late. Always with plenty of time to get things buttoned up. Every AS trip for me starts and ends with QX. It wasn’t offered in Galveston, Port Canaveral, or Boston the last time I cruised out of any of those, but truth be told, that’s a service I’d even pay extra money for if it were offered. The whole process of finding your bags in the customs hall, getting them to the airport shuttle, and then going to the bag drop at the airport is a real beating at the end of a cruise. Alaska switched to boarding most flights at T-40 several years ago, and often starts even a bit earlier than that. Not really sure why but I guess it works for them. I’ve never been impressed with their bag service guarantee process, especially at outstations where it’s hard to find a staff member. Delta’s automated system is far more convenient. I’m used to hearing my name over the PA for “final boarding” 25 min before departure on AS. It’s annoying, but still preferable to all my recent WN flights, where even “on time” flights can’t manage boarding and pushback within 15 min of scheduled departure time. For an airline that used to be known for quick turns, they’re hopeless now. I don’t know what it is.They (mostly) aren’t big delays, but it’s a pretty stark contrast to every AS flight I’m on, where pushback is generally early or at least, right on time. The bag valet service by the cruise line / cruise port / airport sounds absolutely amazing, especially as it reduces the stress and the “hurry up and wait” factor of several thousand people trying to get off a cruise ship and rush to the airport all at once. 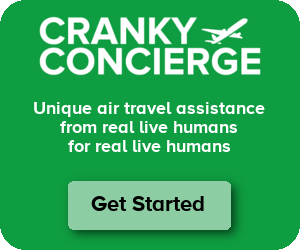 I wonder who pays for the service (mainly for the costs of transporting the bags from the cruise port to the airport, as I imagine that the other marginal costs of the program are minimal) and how much it helps the cruise line, cruise port, and airport / airlines in terms of better productivity. It should certainly help to reduce congestion at the bag drops and kiosks at the airport. I know you spent a few days in Seattle before the cruise, but any idea if they do something similar on the front end, for pax that fly into the airport and then immediately go to the cruise port? Given that it usually takes a few hours anyway after boarding a cruise ship for your bags to be screened and show up in your cabin, this (combined with bus transfers from the airport to the cruise port to haul the pax) would also be a value-added for some. Finally, I’d love to read/hear an Across the Aisle or podcast interview on this program, how it works, who came up with it, etc. I know it’s a relatively small thing, but I find creative ways to improve operational processes like this to be absolutely fascinating, and they are a great way for airports to help differentiate themselves. Kilroy – It sounds like the Port of Seattle pays for the program. It sounds like it’s only for the return. Disney World and Cruise Line offers to transport bags checked at your air origin, directly to the hotel or cruise line. Its pretty neat. You put an extra tag on your bag before you leave, check it at your origin, then your bags show up in your room. The Disney bag service is exactly what I was thinking of as well. You can also check your bags with the valet at the hotel downstairs (or at the front) on the way out to your destination. It basically works, but they did lose our bags for a day one time. This was back on Continental (probably in the last year of their existence), and the lady at IAH said it happens all the time with the Disney service, particularly if you have a flight after noon (we did). They showed up the next day. I’ve heard anecdotes that the PMVX staff can be a bit indifferent since the merger. I haven’t flown any AS flights on the A319/320, so I don’t know how true that is. I’m surprised that AS hasn’t gotten rid of VX branding quickly. I remember seeing all the ex-NW planes got new seat covers and painted really quickly and the ex-NW employees were fitted for DL uniforms really quickly. Wonder what is taking AS so long. I’m thinking it come down to the mighty $$ and resources available. AS runs a very tight ship with little wiggle room. Taking airplanes out of service to make them over takes time, money and resources. Especially during the busiest travel time of the year, summer time. I’d imagine we’ll start seeing more transformed ex-VX planes coming this fall and winter. But yes, it can’t happen soon enough. The brand confusion is real. Also, someone said ex-VX employees are indifferent so maybe they’re not trying very hard to become the AS we all know and love. I’m thinking there will be a very rough culture transition for them. I used the bag check program on Royal Caribbean in FLL for.a Sothwest flight. IRC, I paid extra for it. If you had gate-checked your bag and then walked on to the plane and tucked it in the overhead bin, what would have happened? If the lead FA sees the tag when you walk onto the plane, they are not to let you go beyond the door without dropping the bag off on the jetway. However, you can take the tag off the bag and stuff it somewhere else (like in your bag) and no one is the wiser. I saw a number of people doing that on an AS flight last week. Rather ticked me off (at the people who did that, not the airline). So if you do that, what happens to the bag record in the system? Isn’t every bag scanned as it gets put on the aircraft, so they would know it “disappeared” from the jetway? Flight attendant here- At my airline if I see a tagged bag come on and I know we have room, I just have the passenger rip it off and leave it with me. I give it to the gate agent to off-load it. Don’t know how it works at Alaska but the checked bag count is somehow involved with our weight and balance, so our policy is to have the gate agent remove it as a checked bag. The cynic in me suspects that if they don’t put a lot of signage out and their staff sometimes “forgets” to mention the 20 minute baggage claim guarantee and the make the process more difficult, they won’t have to pay out as many claims. Regarding the 20min baggage guarantee, the easiest thing is to contact them on twitter. I send a DM (usually from the uber leaving the airport) with the flight information, my confirmation number, and mileage plan number, and they add it to my account immediately. Their system can confirm the bags didn’t arrive within 20 min since each one is scanned as it reaches the belt. Regarding the mention of the baggage guarantee on the flight, apparently Virgin plane switched over the the Alaska uniform, script, and safety demonstration yesterday. I had a conversation with the flight attendant about it on my Tuesday virgin flight. The bag service is provided by a company called Bags Inc. They offer it at lots of ports – but there has to be buy-in from the airline (not all participate) and the cruise line. At the port I worked, pax paid the fee, which I believe was split between the cruise line and Bags Inc. Sounds like Port of SEA covers it there to improve the cruise/airport experience. Ship’s staff hated the program, because it used 3rd party IT infrastructure that they couldn’t troubleshoot or fix effectively when it went down at 10pm the night before the cruise arrived in port, while they’re printing everyone’s bag tags and boarding passes. Also, if an airline or TSA kicked back a pax name for additional security screening, they couldn’t use the service and the cruise line staff had to deliver the bad news. And if your bag doesn’t show up at the end of your flights – who takes responsibility? Did the cruise line lose your bag, or did the airline? Both happen. It also doesn’t work for international flights or if any leg of your trip is with a non-participating carrier. In short – great when it works well, can be a nightmare when things go sideways. Cruiser since ’89 here. At the Ports of Miami and Everglades, pre-9/11 and bag fees, airlines each had a truck outside each pier, and once you claimed you bags, you walked over and they would tag them and throw them on the truck and you’d see them at baggage claim at your destination. They also had the same thing for the outbound. You’d tag them at your outbound with the ship’s bag tag and, if it didn’t get ripped off, it would get picked up after landing and transported directly to the ship. You could skip baggage claim and go right towards your transfer. This recently started happening again in the last 3-5 years, except there’s a charge on top of the bag fee. – Just flew from JFK to SEA on Alaskan and returned on Delta. – Very easy and quick self bag check in process with employees using handheld devices. No need to wait on line or even approach the counter. – Boarding was very well managed and clear, with every single customer being addressed and thanked by name at the gate reader. – Very roomy overheads. No issues. – The FA’s were excellent and gracious. Helping everyone and offering to help. FA’s even stowed some bags in the overhead for a bride and her wedding dress, and 2 elderly customers who couldn’t lift the bags. Very unusual to see FA’s lifting bags for customers. They were great for the whole flight. – Smooth arrival process in Seattle – Arrival Jet bridge interior was dirty. – Bags in claim area when we got there – Well managed taxi/Uber pick up area. No problems. – No self tagging process and very, very long lines at the counter to check a bag. Went back outside and used the Skycap. – Boarding was very disorganized and gate agents didn’t manage the process at all. Everyone boarded through the Premium line. – Very roomy overheads, No issues. – The Captain was entertaining with his announcements – FA’s were efficient but not friendly. They never smiled. – They ran out of coffee creamer 1/2 way through the flight. Black coffee only. – Two lavatories ran out of toilet paper about 1 hour before landing ( Yuk ). Told FA’s but don’t know if they restocked it. No supply in Lav cabinets. – Waited 10 minutes for someone to park the plane on the gate upon arrival. Think they missed Arrival 15 by 4 minutes as a result. – Jetbridge interior was very dirty – Waited 55 minutes for bag delivery, with zero Delta employee presence in the claim area to make announcements. – Taxi/Uber pick up area was out of control and in gridlock. No traffic guards managing the process at all. People were parking and locking their cars at the curb and going inside to find people. Redirected our pick up to Terminal 7 ( Alaskan’s Terminal ) and went there. No issues. Smooth pick up. You have to count out your Taxi/Uber pickup experience. This is usually negotiated by Taxis, Lyft, and Uber with the airport. At Seattle-Tacoma Intl Airport, they have Taxis, Lyft, and Ubers, all picking up on the third floor of the parking garage so that they’re out of the way of the arrivals lane, which can often be gridlocked. At JFK they’ve got Lyft and Ubers just picking up at the arrivals lanes like anyone else. Oh FYI, its Alaska Airlines, not Alaskan. Sorry, i beg to differ as far as JFK goes. JFK has 8 Terminals, all managed by single anchor airline tenants, with the exception of Terminal One and Terminal 7 which are managed by a consortium of AF, LH, KE and AZ for Terminal One and BA and AS for Terminal 7. Delta is the ,major/majority tenant in their Terminals 2 and 4, while Terminal 7, Alaskan’s Terminal, is managed by BA and AS. In ALL cases the carriers or consortium of carriers that manage the terminals are responsible to manage the roadway traffic in front of their terminals. This means hiring vendors to essentially direct traffic and to enforce “no standing” and/or “no parking” regulations for the Terminal and the Airport regardless the car, bus, etc. This is critical during high volume periods. Delta has one guard directing traffic for 4 lanes of several hundred cars which is always completely out of control. I have arrived at Terminal Four on Delta before during the peak. It is always a mess. The mess starts at about 2pm and usually goes until 11pm. They have to put some time and effort and manpower into keeping the traffic moving. On several occasions I have seen people literally stop and lock up their cars in the center lane of traffic and go inside to look for people. Assigning just one guard ito control traffic s penny wise and pound foolish. I have also arrived dozens of times at Terminal 7 on BA, Alaskan and United which was in the terminal for over 20 years before they left JFK. There are a half dozen other carriers their too ( NH. CX, IB, etc. ), although BA and AS manage the Terminal. Terminal 7, which like the others is managed by the majority tenants ( BA and Alaskan ) has put the time and effort into ensuring they have a very effective groups of guards and traffic directors moving the cars along. They usually have about about a half dozen strategically placed to keep things moving. Like I said in my last post, I told my car to go to Terminal 7 versus 4 fo the pick up, and I took the monorail to 7 to avoid the chaos and long waits at 4. Delta seems to be ignoring vendor performance. I used the ship to plane luggage valet a couple times in Florida. Sorry, I don’t recall which airport or cruise line. Both times our seats mysteriously changed from Main Cabin Extra to the back two rows of the plane. At least one of the times we also got charged for the bags even though I had noted we were AA Gold. The cruise line did promptly refund the fees when I called them post flight. So now we just take the bags ourselves. Last year we cruised out of Ft. Lauderdale and Royal Caribbean offered the same service. I don;t thin k the Prt has any say in it. Mre the Cruise line and the Airline(s). It really worked well and saved a lot of moving baggage.